After last week’s brief introduction, “The Human Monster” shows us what our heroes will truly be facing when they eventually battle with Garou. We also learn a little bit more about the inner rankings of the Hero Association. 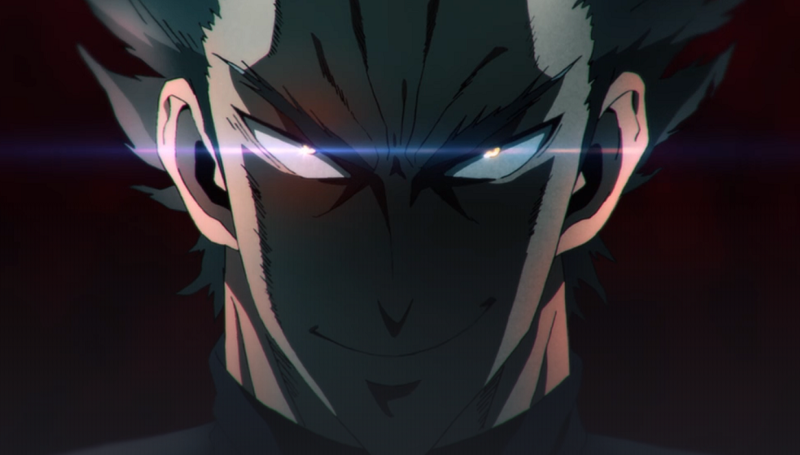 “The Human Monster”, for someone who hasn’t yet read the One Punch Man manga, is a terrifying look at the kind of villain Garou will be. Able to take out strong heroes – and an entire room of bad guys – without seeming to exert any energy or even really move. However, I don’t understand his motivations at all. I’m sure it’s explained in the manga, and from what I can tell based on episode discussions, his backstory should have been featured in this episode and wasn’t, so I can only hope that’s something they introduce later. This week’s fight scenes don’t look all that much better than last week’s, which is unfortunate for a show that contains a lot of fight scenes. I thought that the editing was a slight improvement – this week’s action sequences weren’t intercut with a conversation happening in another location, so I thought they flowed a lot more smoothly – but they seem to be missing half of their frames. They don’t show us Saitama stopping Genos’s Maximum Incinerate ability, nor do they show how he defeated Speed O’ Sound Sonic “with shockwaves”. 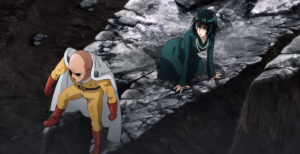 Good action sequences will show the moment of impact, but One Punch Man is relying on showing the moment before and the aftermath. On the plus side, this is making me super eager to read the manga. (I plan on starting as soon as I’m caught up with Black Clover.) But honestly, everything is going to seem like a step down after the brilliance of season 1, so we have to take everything with a grain of salt. I do love the character interactions. Seeing Blizzard’s reactions to both Saitama in action and how he casually pals around with higher-class heroes like Genos and Saitama was great. Even the little moments, like Saitama freezing up when he learned that Genos did, indeed, have a fan club, or the subtle way he was freaking out when King came over to get his game console back, were stellar. Something else I enjoyed was this further look at the dynamics of the Hero Association. It’s interesting to see everyone’s different motivations for joining – Genos is driven by revenge against his town and a desire to prove himself to Saitama, while Blizzard seems to be motivated by insecurity. Despite being classified as “heroes”, not all of them appear to be good people, which is good; flawed characters are more relatable and more interesting to see. This is an anime that will be carried by its story, so it’s a good thing that it’s amazing. One thing about the title – you have no idea to whom it is referring. Of everyone featured in this episode, “The Human Monster” could honestly refer to several of them. I’m sure you’re meant to assume it’s Garou, a human who has allied himself with monsters and therefore is the most obvious choice. 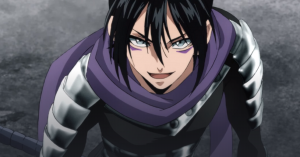 But it could also be Sonic, who moves with inhuman speed, or Saitama, who destroys his enemies with a single blow. Previous:Open-World Tower Defense Game “Eden Rising” Launching This May!